Data retention settings are used to configure how long audit and reporting data is retained. In order to keep a very speed-optimized database while reducing service costs, it is highly recommended that you adjust your Data Retention Settings to match your requirements for the different reporting data types. To adjust the length of time that each data type is stored, go to Settings > Security and then click on ‘Data Retention’. 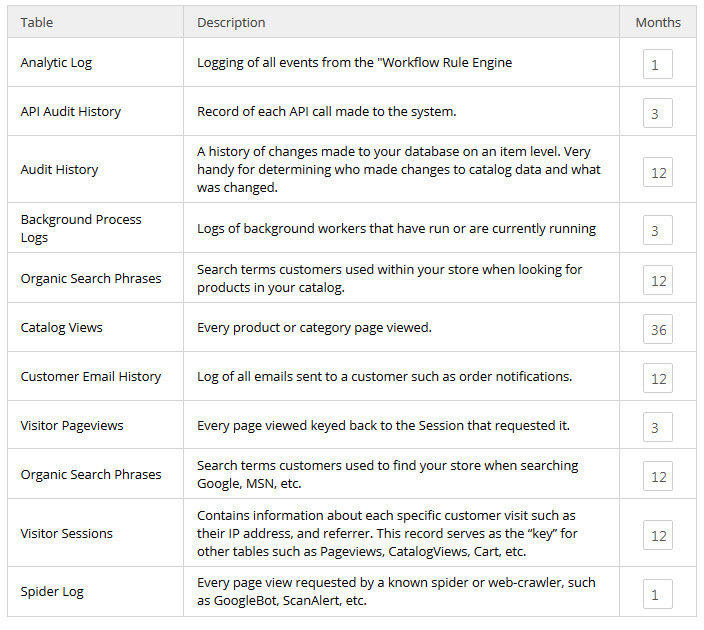 Next, you will see a list of reporting tables that can grow rapidly on large sites. Assign a retention value for how many months you wish to keep the reporting information. If you wish to only keep the current day’s data, specify a “0” for the Retention Months. Note: Removing data from these tables does not affect your customers, order history, products, or other store information. Below the ‘Basic Data’ section, you will see the retention settings that apply for credit card data. You can use this to indicate how long (in months) that credit card data should remain on record. All other information will be preserved.